If your LinkedIn profile was written like a resume, how's that working for you? 75% of B2B buyers conduct research on social channels looking for information on products and services they need. They're also using LinkedIn to do research on you too. We developed this course to address one of the most common mistakes B2B sales professionals make - a social profile that was written as a resume....Your prospective buyers are NOT looking to hire you, they ARE considering buying from you. In this online course you'll learn how to optimize your profile on LinkedIn and Twitter to create more sales conversations. How to be appealing to your "audience"
Social Selling Tools, Processes, Etiquette & Behavior and more. This online course is ideal for B2B sales professionals, business development directors, entrepreneurs, business owners, executives - anyone who depends on growing their network to develop and maintain a thriving business. Your social profile should be written as a sales asset that helps you build your network. Your social profile on LinkedIn and Twitter should get you invited into sales conversations..
Social media is here to stay. Buyer's use it. You should harness its sales potential. If you're confident in your experience with LinkedIn and Twitter, we provide a fast track option that you can experience in minutes. Most business professionals benefit from the entire course. We've designed the lessons in bite size format, most in 5 minutes or less. You can watch and listen to this course from your desktop or mobile device, anytime, anywhere. Sales Teams. For 10 or more people, contact us at sales@socialbusinessengine.com for group pricing. For even more training on social selling, go to Improve Your Sales Using LinkedIn & Twitter. Bernie Borges is a veteran B2B marketer and Social Business Practitioner, with a 30 year career in sales, marketing and entrepreneurship spanning New York, Silicon Valley and Florida. Borges is the Executive Producer of the Social Business Engine and CEO of Find and Convert. Bernie is the author of Marketing 2.0, one of the earliest books written on social media strategy. He is a frequent speaker at marketing conferences, and a former AMA Face to Face Workshop Faculty member. Borges is an IBM Futurist, Dell Social Influencer, and has been recognized numerous times by industry peers, including Likeable Local’s 150 Marketers To Follow, and Online Marketing Institute’s Top 15 Digital Marketing Educators, and is a regular contributor to Social Media Today and Social Media Strategies Summit. I was impressed with the detail provided in digestible snippits of useful advice. I completely reworked my profile based on your course and now ranks in the top 75% of LinkedIn profiles. If you are a professional looking to improve your performance on social media, these courses are an excellent foundation. They begin with the end in mind and walk you through each step in a strategic and thoughtful way. You will want to block a little extra time for in order to make the most of your investment; it will pay off in spades. These courses leave you looking like a leader in your field versus a rank amateur. 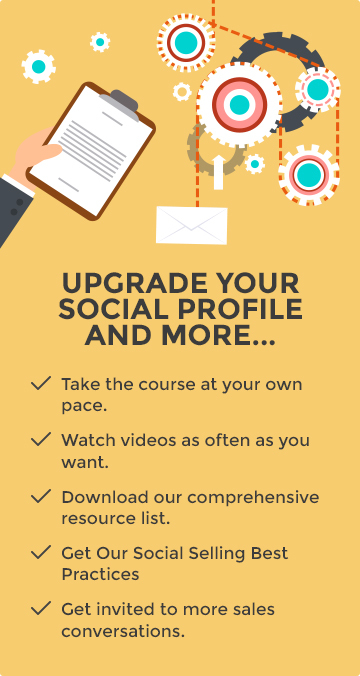 This course gave me a great template on how to focus on my social profiles in a more professional manner. It was enlightening to think of all the parameters that go into developing a social media platform that works for me 24/7. If you are not using your social profiles to help increase your business success, you should be and this course is the way to get it done! I give this course a top rating! The "Optimize Your Social Profile for Sales Success" online course provides detailed instructions and guided me through the process of using Social Media to connect with my target audience. As an entrepreneur, I found Bernie Borges' course easy to follow, informative and it has boosted my confidence to engage in social media for my business. I highly recommend it.